This is just a short post to show how a few small changes can elevate a simple dish to something a little more. 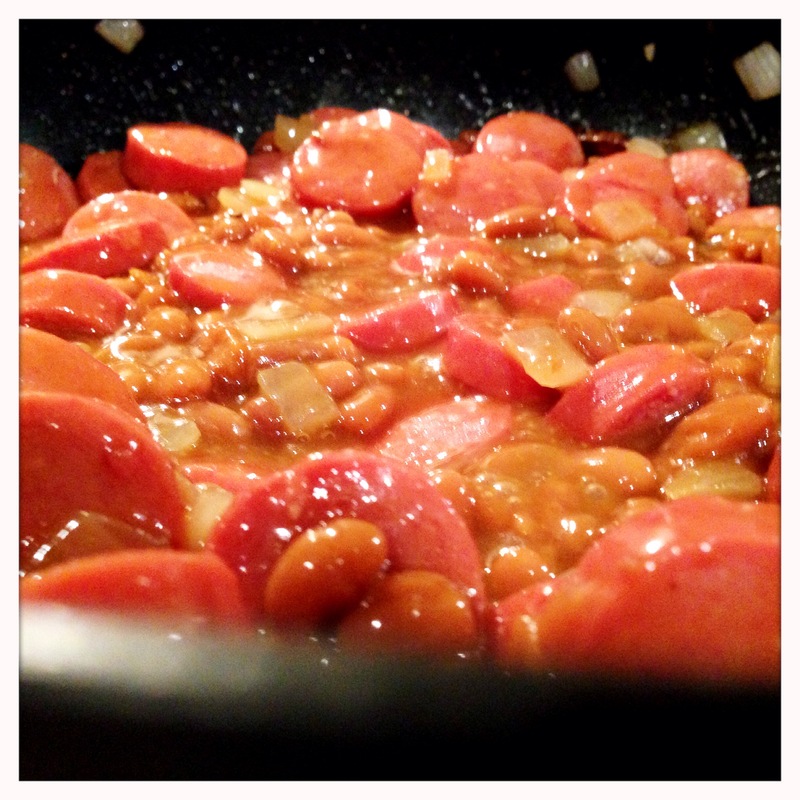 This post covers an American classic – hot dogs and beans. This is not a post about using homemade sausage and creating amazing baked beans from scratch. That would be delicious, but it’s not necessarily practical for a busy weeknight. Instead, this post focuses on how adding 5 minutes of work can make a huge impact beyond just slicing hot dogs into some beans and warming it all up. Any time I use any prepared foods, I always boost them with a little something fresh to breathe a little life back into it. So, let’s get started. 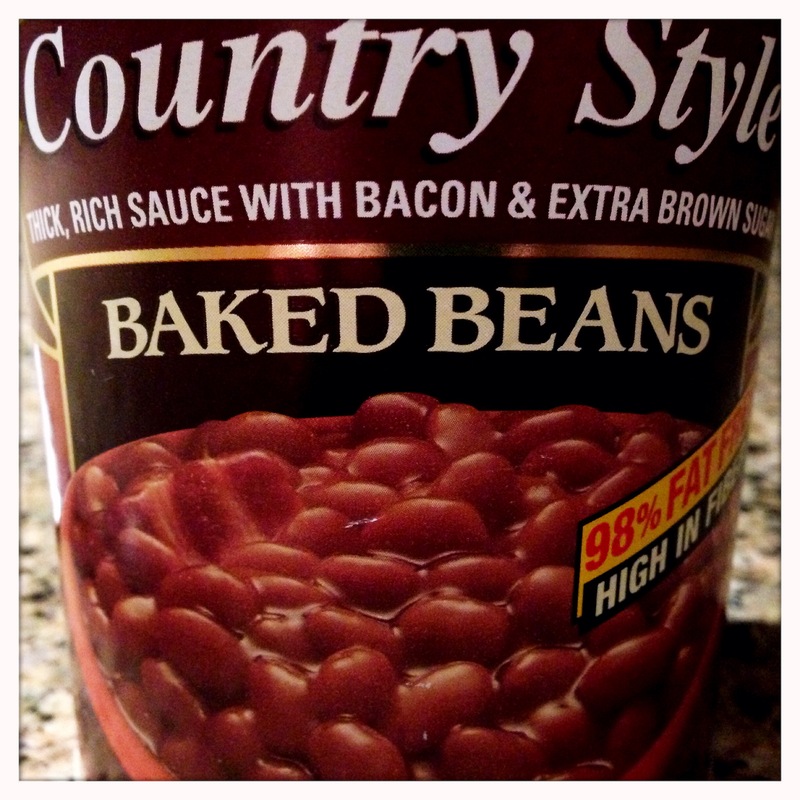 There’s lots of styles out there when it comes to baked beans. I tend to go with either a style with “extra brown sugar” or a style flavored with bourbon, but go for your favorite. Slice the hot dogs into 1/4″ to 1/2″ thick pieces and roughly chop the onion. Heat a little olive oil in a pan, and cook the hot dogs and onions. You want the onions to soften and become translucent. You also want a little bit of browning on the hot dog slices to add extra flavor to the dish. 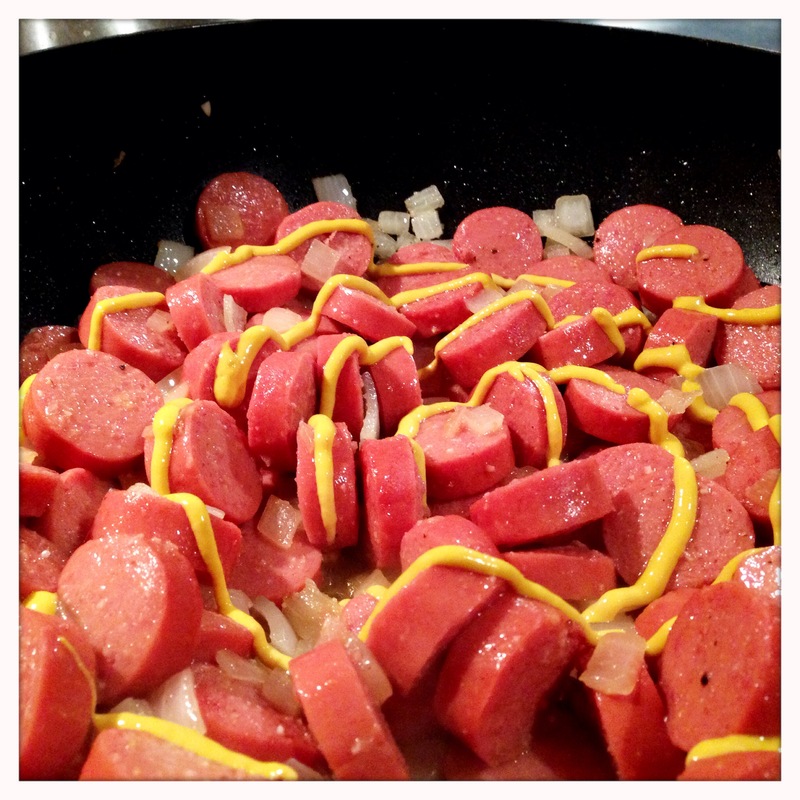 Once the onions and hot dogs are cooked, add some yellow mustard. This goes a long way to add a unique flavor to this meal and cuts the cloying sweetness of canned baked beans. Stir in the mustard, and then add the beans. Stir well, grind a little fresh black pepper over the top and simmer covered for about 20 minutes over a medium-low flame. I don’t have a photo of this in a bowl, but it pretty much looks like that photo above…but, you know…in a bowl. There are many more things that can be done with hot dogs and beans. The same cookbook that has my mom’s sloppy joes also has her hot dog bean casserole recipe, which is similar to the recipe above but involves slicing the hot dogs lengthwise, filling with cheese and wrapping with bacon. Then cooking the whole thing together with the beans. It’s pretty awesome, and will likely be a post in the future. But, for now, enjoy the simple additions above that make a canned, processed meal taste like its homemade. It’s a fun meal for kids and a tasty comfort food on a chilly evening. Enjoy!